Stunning recognition for 2 Death March witnesses | Daily Express Online, Sabah, Malaysia. Tham Yau Kong was the happiest man last week. After 13 years of relentless trekking to unearth exactly where the mid-Death March track went, he said he shed "tears of joy" seeing two of his most heartfelt dreams come true: One, a magnificent Tuaty Gallery perched at a strategic setting at Bauto Forest Reserve, in honour of an original Death March track cutter, Tuaty Akau, 102, whom he found by sheer chance in June 2016 at Kg Buis, while leading a British Royal Engineers for a full-length 260km trek. Year 2016 was the height of dispute between two Australian war historians over the direction of the mid-track. Dr Kevin Smith insisted the mid-track went to Miru Kampung via the Liwagu Valley. Lynette Silver argued it never did, except the Taviu Valley marked by a Big Climb. Tham was caught in the crossfire. But all of a sudden, an unbelievable living eyewitness track cutter Tuaty popped up 70 years after the Death March. Tham asked Tuaty the burning question: Did you cut the track to Kg Miruru? " Tiada (no such thing)," came the ironclad reply. So, here was a direct eyewitness testimony which eliminated the alternate Liwagu track. The second point: Tham often felt guilty that he was the one who misled Sabah Society's 60-year commemoration of Sandakan Ranau Death March to Kg Miruru via the Liwagu Valley in August 2005. But he reasoned he was given Dr Smith's map which plotted the track to destination 'Miru Kampong' on purported evidence from Japanese Army Death Certs. Incredibly, Tham found another living eye witness – Zudin, who worked as a bullets porter for the Japanese Army who said the Death March track never went to Kg Miruru where he was actually born and bred. But just like there are 18 "Londons" in the USA and more elsewhere, there were two Mirurus in Sabah in 1945. Like Dr Smith, Tham knew only one – Kg Miruru which in 1945 was located on the other side of the huge Labuk River. "Inilah Jipun panggil Kawasan Miruru (This is the area the Japanese called Miruru)," referring to a larger forested jungle area covering the confluence Sg Tagak, Sg Lololosing and Sg Taviu, a kilometre long deep gorge, steep cliffs, ridges and a major Japanese Army Campsite and munition dump. Again, Zudin's direct eyewitness testimony dismissed destination Kg Miruru. "I felt very conclusive, this was the answer to where the mid-track went, confirmed by a living eyewitness. "There's nothing to argue any more. I felt very happy that Zudin has been recognised with a Lookout Platform named after him," Tham said. But strange as it might seem, the trigger to these fantastic landmarks dates back to the day when Dr Smith and Lynette took their open dispute to Daily Express. I decided to investigate who's right when Dr Smith suggested that I had previously been verbose in favour of the correctness of Lynette's Aussie Army Body Recovery Team mud map over the years. To cut the story short, I wrote some 10 special reports on Zudin and Tuaty's direct testimonies on proving a historical fact beyond doubt. Tham mooted the idea of a Tuaty Track and a Zudin Track in their honour. 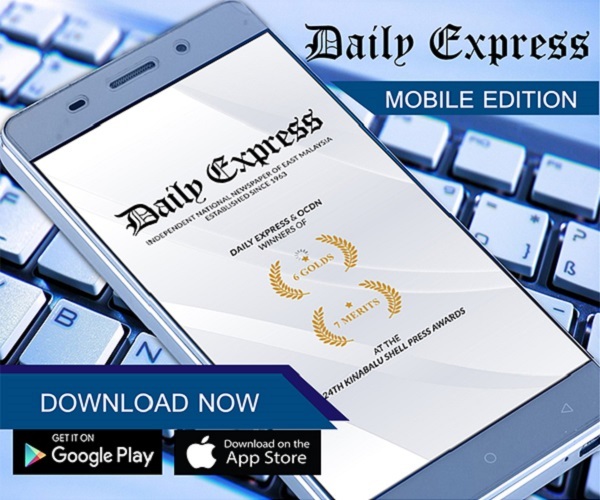 It drew the interest of Daily Express Editor- in-chief, James Sarda, who called and suggested to then Chief Conservator of Forests Datuk Sam Mannan, why not turn the whole mid-track into a worthy tourist draw. But Forestry Department did an independent fact-check on both Zudin and Tuaty. Mannan sent Indra Purwandita Sunjoto, Senior Assistant Chief Conservator of Forests (Forest Management Enterprise), to interview Zudin at his house in Kg Kopuron, near Telupid. He also sent Mohamad Abu Bakar, District Forest Officer for Telupid, to interview Tuaty Akau in Kg Tonintin, near Beluran. Indra's verdict: "The stories of these two were consistent with each other." Satisfied with the historical facts established, Mannan asked Lynette to write a working paper. The next thing was a meeting at Forestry Headquarters chaired by Mannan, with Arkitrek Sdn Bhd, who explained the concept to the gathering which included Daily Express, Lynette, Tham, Fred Kugan. 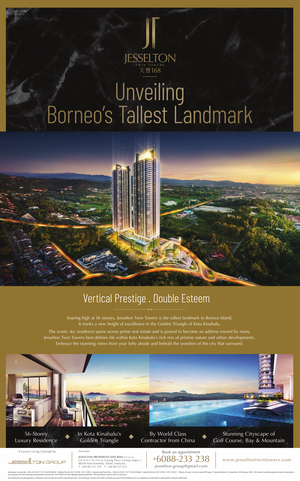 Now we see these concepts translated into fantastic realities by contractor Buildtech Sdn Bhd. But the last touches – information panels on the general stories of the Death March are yet to be done. So, if anybody is still in doubt about the veracity of the 30km-long Taviu Valley Death March route, the most convincing iron-clad proof is get hold of a copy of the mud map and trace the track from Boto (Bauto) to a series of small rivers marked S. Gambaron, S. Malio (Maliau), S. Talupit (Telupid), S. Tapang (Tapaang), S. Baba, S. Tararangag (Binantaran), S. Tundom (Tunob) and S. Lolosing, which are all marked by JKR with modern spelling indicated in the brackets! Pinning down the midtrack took Tham 11 years! But accurately unearthing, pinning down and confirming this 30km midtrack which traverses two forest reserves took Tham and his Kiau boys 11 years of blood and sweat work. It started in August 2005, he said. Immediately after Sabah Society's 60- year commemoration of the Sandakan Ranau Death March ended on Aug 25 that year, Lynette, whom Tham did not know then, approached him and offered the Mud Map to look for the right track. Upset that nobody was willing to fund this hunt, the search went ahead when the Kiau boys assured Tham: "Don't pay us, we want to help you to retrace." In Nov 2005, Tham and Kiau boys Sadib Miki, Jimmmy Kinsos, Maik Miki and Dun Limunduk set out to Jalan Kaling, an old road to Tongod past the Tawai Forest Reserve office then turned right to cross the Telupid River marked S Talupit on the mud map. In December 2005, Tham mounted the third recee this time a descent via the Hunters' Trail called the 1st Taviu Hill track towards the Kopuron area and met a local guy named Stanley who opened up more facts about the Death March track. This time Johnny Lagati replaced Sadib Miki. In January 2006, the 4th re-tracing started from Kopuron for 3km to Stanley's house before emerging to the main highway via the Hunters' Train or the 1st Taviu Hill track involving Maik Miki, Jimmy Ginsos, Dun Limunduk and Johnny Lagati. 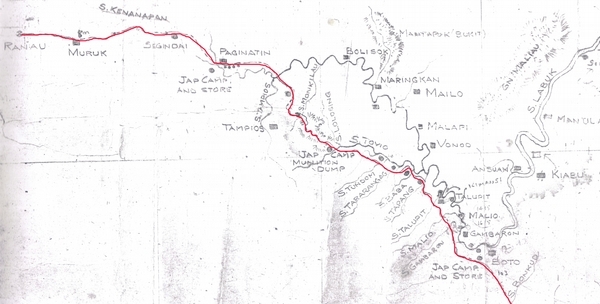 On March 15-20, 2006, the first tourist group comprising nine Australian army, three Canadian and a Hong Kong lady journalist and AmBank CEO Aussie Neil Hamilton walked the mid-track from Bauto to Gambaron, then from Telupid following the Kaling Road, crossing all the rivers marked on the Mud Map – S. Malio (Maliau), S. Talupit (Telupid), S. Tapang (Tapaang), S. Baba, S. Taranrangag ( Binan tararan and S. Tundom (Tunob) and finally climbed up the Hunters' Trail or 1st Taviu Hill track enroute to Ranau. But, somehow, Lynette said something was still missing: Where is Lolosing marked on the Mud Map? All the walks thus far would not be accurate without covering Lolosing and pressed Tham to look further. In April 2007, meeting Umpil, an old man who once ferried the Japanese crossing the Labuk River at Tampias, opened that door to Lolosing. "The following month, we drove Umpil to the top of Taviu Hill 2 and he pointed to the ridge where the Death March track ascended from the Lolosing area. I knew that was a big step towards connecting the dots," Tham said. "But when I first discovered Zudin in May 2008 while walking past his house in Kg Kopuron, I only knew he was a fascinating blowpipe man but did not know he was once a weapons porter for the Japanese army along the Death March track," Tham said. The final triumph – pinning down the ridge and infamous Big Climb! Determined to track into Lolosing, in May 2009, Tham engaged local Stanley to guide him and the Kiau boys into Lolosing through the 1km gorge for an ascent of Big Climb Taviu Hill 2 but missed the ridge that was the true Death March track. To correct that omission, Tham returned in October 2010 and using the information provided by Umpil, descended via the ridge into the gorge and into Lolosing, emerging at the confluence between three rivers: S. Lolosing, S. Tagak and S. Taviu, with Jimmy Ginsos, Dun Limunduk, Johnny Lagati and Johan Liansin. But the only tourist group to have walked into Lolosing, the gorge and up the big climb via the ridge is a group of Sabah Salute British soldiers, guided by Jimmy Ginsos, Johnny Lagati and Peter Sempit, partly because the narrow gorge is dangerous when it rains.